We liked Payday 2. We liked how unrepentantly bad it made you be. We liked its focus. And we liked its crimes. We could happily play a Payday 3 and 4. But Overkill might have other plans. A page went live yesterday on the Overkill website that teases what’s next. So far, it’s suggested something to do with personal trainers and loo seats. 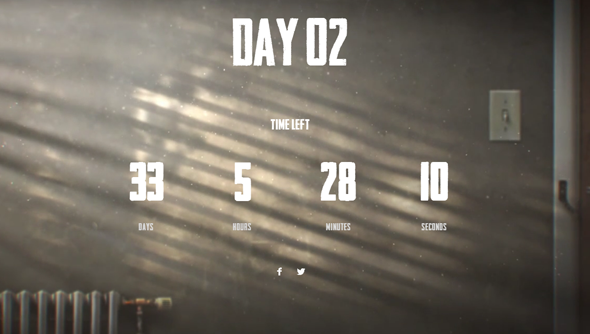 The new page is a countdown and a picture of a nondescript wall. I won’t talk about the radiator and lightswitch that break of the beige, nor the light coming through the shutters, that’s for you to enjoy when you follow the link. Each time you load the page an audio file plays, different snatches of idle chit chat between two people. So far, I’ve heard the guy complain that a personal trainer who conducts group classes at the gym is not a ‘personal’ trainer, and that his toilet seat has a really slow close, one that lasts all night. We’ve got to wait 33 days till the 13th August for the countdown to come to an end. It might be a new game, it might be a sizeable chunk of DLC for Payday. I’m hoping it’s a literal fly on the wall game where the objective is to sit and listen to two people’s idle chat for days on end.